Is a Divorce Decree Supposed to Be Signed by the Petitioner & the Respondent? Ending a marriage involves terminating a personal relationship as well as a legal one. To obtain a legal divorce, one spouse must file paperwork with the court where he resides requesting the dissolution of the marriage. This can be done with or without the involvement of the other spouse. Depending on the kind of divorce, the final divorce decree will either be signed by one or both parties. The first document filed in a divorce is the Petition for Dissolution of Marriage. This document states that one or both parties seek to dissolve the marriage; it then lists the legal grounds for the request. One or both parties may sign the petition. If only one party signs the petition, that party must serve the other party with the petition and a summons. If both parties sign the petition, the court deems the parties in agreement and no trial is scheduled. If one party serves a petition and the other party fails to respond within the state statutory time limits, the filing party can submit a signed divorce decree for the approval of the court. The divorce decree is the formal court order setting forth the terms and conditions ending the marriage. This document is also called a final decree. This document explains how the couple's property will be distributed at the end of their marriage. This includes the terms regarding property division, child support, alimony, child custody and visitation. It can also include any specific instructions pertaining to the raising of the children such as religious preference or location. The county courthouse records office permanently keeps the final divorce decree in its archives. In an uncontested divorce, the parties agree on the terms for ending their marriage. The parties or their attorneys draft a marital settlement agreement, which sets forth the specific terms of the agreement in detail. This document becomes the divorce decree once it is approved and signed by the judge. Both parties must sign an uncontested divorce decree before submitting it to the divorce court. Once the judge approves and signs the divorce decree, the divorce is final. Contested divorces occur when the two parties cannot agree on some or all of the issues regarding the finalization of their marriage. In these cases, the issues go to trial and a divorce judge hears evidence. Following the trial, the judge makes a decision and then issues a judgment. 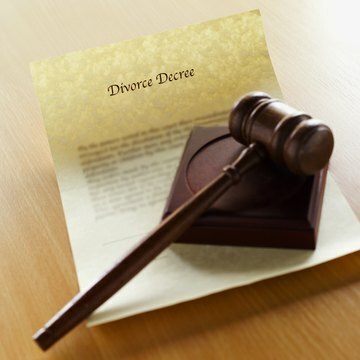 The parties then have to wait a period of time before the written divorce decree is issued and signed by the judge. Neither party signs the decree in this case. What Is a Correct Date of Divorce: the Date of Filing or Date of Judgment of the Divorce? Georgia state laws govern the process of divorce. The state has adopted “no-fault” divorce, meaning you do not need specific grounds to file a divorce petition, other than a claim that the marriage is “irretrievably broken.” A hearing in civil court will be necessary, however, and the state also has residency requirements for couples seeking a divorce. What Happens After a Legal Separation Is Filed? Whether a couple can file for legal separation depends on state law. In those states that make legal separation available, the process is often similar to divorce. The couple can enter into their own separation agreement or let the court resolve their marital issues, such as property division and child custody. Once a separation decree is issued, the spouses' lives are officially separate. For spouses who later decide to divorce, they can often convert their legal separations into a divorce. Is North Carolina a No-Fault Divorce State? North Carolina, like every other state, has an option of filing for no-fault divorce. However, certain requirements must first be met. When you know what is required before filing for no-fault divorce in North Carolina, it can save you time and money. How Long Do You Have to Wait After Legal Separation to Finalize a Divorce in Colorado?